Want to show off sleek and toned legs this summer? 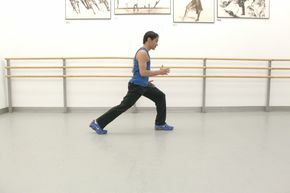 As temperatures continue to rise, Ailey Extension fitness instructor Sam Salazar shows you how to feel the burn with the best workouts for your quads, hamstrings, and glutes. Plus, get ideas for healthy snacks to satisfy your sweet tooth. Summer is almost here – what are your favorite exercises for achieving toned legs? What is High Intensity Interval Training, and how does it help achieve results? HIIT is a form of cardiovascular exercise that alternates periods of short intense anaerobic exercise with less-intense recovery periods. It achieves results because the intensity of the short-duration exercises creates a prolonged afterburn, or EPOC (excess post oxygen consumption). This type of training causes the body to take longer to return to its state of rest, so it continues to burn calories at a higher rate – 5 times as fast – long after the workout session has completed. What are some tips to build muscle without adding bulk? Dancing is great for that, as are any exercises you do with your own body weight – essentially what we do at our Bootcamp with Sam class on Wednesdays at 6:30pm. Are there any specific food guidelines that you stick to? My food intake is very low in sugar, and I do not eat any fried foods. I eat lots of grilled and roasted foods and lots of vegetables, and I drink a lot of water. What healthy snacks do you suggest eating before and after workouts? Are there any sweet yet nutritious treats for when you want to indulge? My healthy snack is a smoothie with kale or spinach, plus banana, berries of any kind, and, if I have it, I add some whey protein powder. When I want to indulge with sweets, I have a greek yogurt with some kind of fruit. What motivated you to become a fitness instructor? I was bored of doing the same thing every time I went to the gym, so I wanted to learn different things and mix it up – and I love it. Now I know the best ways to exercise -- and also the safest ways. As a Certified Fitness Instructor, it is important to make sure that every single one of my students is exercising safely. What do you consider the most rewarding part about teaching fitness at the Ailey Extension? For me, it is the people. I have met amazing people through the years since I started teaching, and I consider several of them my friends now. Just to be a part of this legacy is a privilege and I am thankful for it. The Ailey Extension gives you the chance to take any dance or fitness class any day of the week.